If needed, you can enrich your articles pages using illustrative article icons. These icons are illustrations that you can upload yourself and -when choosing a suitable category layout- will show next to your articles. To manage the available icons, add new ones or delete unused icons you can go to "Tinyportal" and in the Tinyportal menu choose the "Icons" option. You will see the screen as below, which allows you to review available icons and upload new ones. 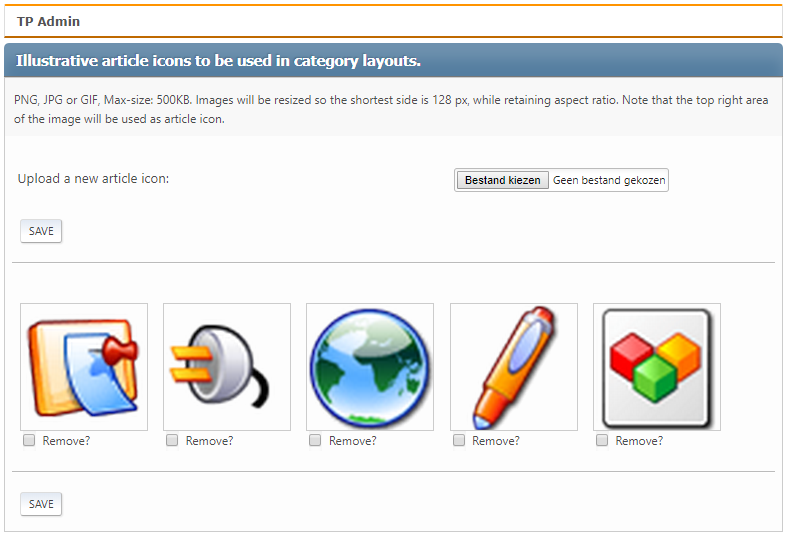 Note that the article icons will be automatically resized to a maximum size of 128x128 pixels. This section shows "Illustrative article icons to be used in category layouts"
By choosing a file from your local drive(s) you may upload a new icon to Tinyportal. Existing files are listed, and can be selected for removal if needed. Pressing the [Save] button will confirm your selection. Please note that the icons are always presented at a maximum size of 128x128px. If you upload an image that is not square, the shortest side is used as the basis for resizing to 128px long. The top right corner of any rectangular image is used as the icon. This screen will show you the exact preview of the resulting image in articles. If the image is not to your liking: make sure to always upload an image with sides of even length! Last updated 05-10-2018 by @rjen.